Biotechnology, Genetic Engineering, Cloning, Recombinant DNA, Cloning Vectors, Competent Host, Biotechnology And Its Applications in Medicine & Agriculture. Making curd, bread or wine, which are all microbe-mediated processes, could also be thought as a form of biotechnology. However, it is used in a restricted sense today, to refer to such of those processes which use genetically modified organisms to achieve the same on a larger scale. Modern biotechnology using genetically modified organisms was made possible only when man learnt to alter the chemistry of DNA and construct recombinant DNA. This key process is called recombinant DNA technology or genetic engineering. This process involves the use of restriction endonucleases, DNA ligase, appropriate plasmid or viral vectors to isolate and ferry the foreign DNA into host organisms, expression of the foreign gene, purification of the gene product, i.e., the functional protein and finally making a suitable formulation for marketing. Large scale production involves use of bioreactors. Genetic engineering involves the techniques to alter the chemistry of genetic material (DNA and RNA) and thus change the phenotype of the host organism. Asexual reproduction preserves the genetic information, while sexual reproduction permits variation. Traditional hybridisation procedures used in plant and animal breeding, very often lead to inclusion and multiplication of undesirable genes along with the desired genes. The techniques of genetic engineering which include creation of recombinant DNA, use of gene cloning and gene transfer, overcome this limitation and allows us to isolate and introduce only one or a set of desirable genes without introducing undesirable genes into the target organism. DNA which is somehow transferred into an alien organism would not be able to multiply itself in the progeny cells of the organism. But, when it gets integrated into the genome of the recipient, it may multiply and be inherited along with the host DNA. This is because the alien piece of DNA has become part of a chromosome, which has the ability to replicate. In a chromosome there is a specific DNA sequence called the origin of replication, which is responsible for initiating replication. Therefore, for the multiplication of any alien piece of DNA in an organism it needs to be a part of a chromosome(s) which has a specific sequence known as ‘origin of replication’. Thus, an alien DNA is linked with the origin of replication, so that, this alien piece of DNA can replicate and multiply itself in the host organism. This can also be called as cloning or making multiple identical copies of any template DNA. Recombinant DNA (rDNA) molecules are DNA molecules formed by laboratory methods of genetic recombination (such as molecular cloning) to bring together genetic material from multiple sources, creating sequences that would not otherwise be found in the genome. Recombinant DNA is possible because DNA molecules from all organisms share the same chemical structure. They differ only in the nucleotide sequence within that identical overall structure. In most cases, organisms containing recombinant DNA have apparently normal phenotypes. That is, their appearance, behavior and metabolism are usually unchanged. Restriction enzymes belong to a larger class of enzymes called nucleases. These are of two kinds; exonucleases and endonucleases. The cut piece of DNA was then linked with the plasmid DNA. These plasmid DNA act as vectors to transfer the piece of DNA attached to it. You probably know that mosquito acts as an insect vector to transfer the malarial parasite Into human body. In the same way, a plasmid can be used as vector to deliver an alien piece of DNA into the host organism. When this DNA is transferred into Escherichia coli, a bacterium closely related to Salmonella, it could replicate using the new host’s DNA polymerase enzyme and make multiple copies. The ability to multiply copies of antibiotic resistance gene in E. coli was called cloning of antibiotic resistance gene in E. coli. Recombinant DNA is widely used in biotechnology, medicine and research. Recombinant DNA is used to identify, map and sequence genes, and to determine their function. You may be surprised to know that we have learnt the lesson of transferring genes into plants and animals from bacteria and viruses which have known this for ages – how to deliver genes to transform eukaryotic cells and force them to do what the bacteria or viruses want. For example, Agrobacterioum tumifaciens, a pathogen of several dicot plants is able to deliver a piece of DNA known as ‘T-DNA’ to transform normal plant cells into a tumor and direct these tumor cells to produce the chemicals required by the pathogen. Similarly, retroviruses in animals have the ability to transform normal cells into cancerous cells. The tumor inducing (Ti) plasmid of AgrobcLCterium tumifaciens has now been modified into a cloning vector which is no more pathogenic to the plants but is still able to use the mechanisms to deliver genes of our interest into a variety of plants. Similarly, retroviruses have also been disarmed and are now used to deliver desirable genes into animal cells. So, once a gene or a DNA fragment has been ligated into a suitable vector it is transferred into a bacterial, plant or animal host (where it multiplies). Plasmids and bacteriophages [vectors] have the ability to replicate within bacterial cells independent of the control of chromosomal DNA. Since DNA is a hydrophilic molecule, it cannot pass through cell membranes. In order to force bacteria to take up the plasmid, the bacterial cells must first be made ‘competent’ to take up DNA. Recombinant DNA can then be forced into such cells by incubating the cells with recombinant DNA on ice, followed by placing them briefly at 420C (heat shock), and then putting them back on ice. This enables the bacteria to take up the recombinant DNA. This is not the only way to introduce alien DNA into host cells. In a method known as micro-injection, recombinant DNA is directly injected into the nucleus of an animal cell. In another method, suitable for plants, cells are bombarded with high velocity micro-particles of gold or tungsten coated with DNA in a method known as biolistics or gene gun. The applications of biotechnology include therapeutics, diagnostics, genetically modified crops for agriculture, processed food, bioremediation, waste treatment, and energy production. Cloning is the production of an exact copy of a cell, any other living part, or a complete organism. Cloning of an animal was successfully performed for the first time by Ian Wilmut and his colleagues at the Roslin Institute in Edinburgh, Scotland. They cloned successfully a sheep named Dolly. Dolly was born in 1996 and was the first mammal to be cloned. During the process of cloning Dolly, a cell was collected from the mammary gland of a female Finn Dorsett sheep. Simultaneously, an egg was obtained from a Scottish blackface ewe. The nucleus was removed from the egg. Then, the nucleus of the mammary gland cell from the Finn Dorsett sheep was inserted into the egg of the Scottish blackface ewe whose nucleus had been removed. The egg thus produced was implanted into the Scottish blackface ewe. Development of this egg followed normally and finally Dolly was born. Though Dolly was given birth by the Scottish blackface ewe, it was found to be absolutely identical to the Finn Dorsett sheep from which the nucleus was taken. Since the nucleus from the egg of the Scottish blackface ewe was removed, Dolly did not show any character of the Scottish blackface ewe. Dolly was a healthy clone of the Finn Dorsett sheep and produced several offspring of her own through normal sexual means. Since Dolly, several attempts have been made to produce cloned mammals. However, many die before birth or die soon after birth. The cloned animals are many-a-time found to be born with severe abnormalities. made crops more tolerant to abiotic stresses (cold, drought, salt, heat). reduced reliance on chemical pesticides (pest-resistant crops). helped to reduce post harvest losses. increased efficiency of mineral usage by plants (this prevents early exhaustion of fertility of soil). enhanced nutritional value of food, e.g., Vitamin ‘A’ enriched rice. In addition to these uses, GM has been used to create tailor-made plants to supply alternative resources to industries, in the form of starches, fuels and pharmaceuticals. Some strains of Bacillus thuringiensis produce proteins that kill certain insects such as tobacco budworm, armyworm, beetles and dipterans flies, mosquitoes. Why does this toxin not kill the Bacillus? Actually, the Bt toxin protein exist as inactive protoxins but once an insect ingest the inactive toxin, it is converted into an active form of toxin due to the alkaline pH of the gut which solubilise the crystals. Bt toxin gene has been cloned from the bacteria and been expressed in plants to provide resistance to insects without the need for insecticides; in effect created a bio-pesticide. Examples are Bt cotton, Bt corn, rice, tomato, potato and soyabean etc. The recombinant DNA technological processes have made immense impact in the area of healthcare by enabling mass production of safe and more effective therapeutic drugs. Further, the recombinant therapeutics do not induce unwanted immunological responses as is common in case of similar products isolated from non-human sources. Management of adult-onset diabetes is possible by taking insulin at regular time intervals. What would a diabetic patient do if enough human-insulin was not available? If you discuss this, you would soon realise that one would have to isolate and use insulin from other animals. Would the insulin isolated from other animals be just as effective as that secreted by the human body itself and would it not elicit an immune response in the human body? Now, imagine if bacterium were available that could make human insulin. Suddenly the whole process becomes so simple. You can easily grow a large quantity of the bacteria and make as much insulin as you need. Think about whether insulin can be orally administered to diabetic people or not. Why? Insulin used for diabetes was earlier extracted from pancreas of slaughtered cattle and pigs. In mammals, including humans, insulin is synthesised as a pro-hormone (like a pro-enzyme, the pro-hormone also needs to be processed before it becomes a fully mature and functional hormone) which contains an extra stretch called the C peptide. This C peptide is not present in the mature insulin and is removed during maturation into insulin.The main challenge for production of insulin using rDNA techniques was getting insulin assembled into a mature form. If a person is born with a hereditary disease, can a corrective therapy be taken for such a disease? Gene therapy is an attempt to do this. Gene therapy is a collection of methods that allows correction of a gene defect that has been diagnosed in a child/embryo. 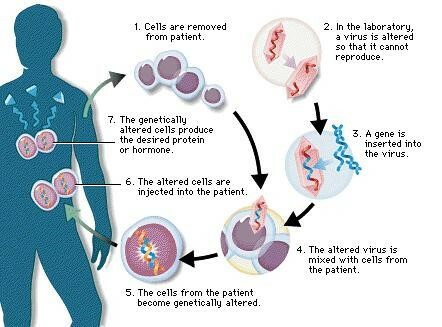 Here genes are inserted into a person’s cells and tissues to treat a disease. Correction of a genetic defect involves delivery of a normal gene into the individual or embryo to take over the function of and compensate for the non-functional gene. The first clinical gene therapy was given in 1990 to a 4-year old girl with adenosine deaminase (ADA) This enzyme is crucial for the immune system to function. In some children ADA deficiency can be cured by bone marrow transplantation; in others it can be treated by enzyme replacement therapy, in which functional ADA is given to the patient by injection. As a first step towards gene therapy, lymphocytes from the blood of the patient are grown in a culture outside the body. A functional ADA cDNA (using a retroviral vector) is then introduced into these lymphocytes, which are subsequently returned to the patient. However, as these cells are not immortal, the patient requires periodic infusion of such genetically engineered lymphocytes. However, if the gene isolate from marrow cells producing ADA is introduced into cells at early embryonic stages, it could be a permanent cure. You know that for effective treatment of a disease, early diagnosis and understanding its pathophysiology is very important. Using conventional methods of diagnosis (serum and urine analysis, etc.) early detection is not possible. Recombinant DNA technology, Polymerase Chain Reaction (PCR) and Enzyme Linked Immuno-sorbent Assay (ELISA) are some of the techniques that serve the purpose of early diagnosis. Presence of a pathogen (bacteria, viruses, etc.) is normally suspected only when the pathogen has produced a disease symptom. By this time the concentration of pathogen is already very high in the body. However, very low concentration of a bacteria or virus (at a time when the symptoms of the disease are not yet visible) can be detected by amplification of their nucleic acid by PCR. PCR is now routinely used to detect HIV in suspected AIDS patients. It is being used to detect mutations in genes in suspected cancer patients too. It is a powerful techqnique to identify many other genetic disorders. Why are these animals being produced? How can man benefit from such modifications? Let us try and explore some of the common reasons. Normal physiology and development: Transgenic animals can be specifically designed to allow the study of how genes are regulated, and how they affect the normal functions of the body and its development, e.g., study of complex factors involved in growth such as insulin-like growth factor. By introducing genes from other species that alter the formation of this factor and studying the biological effects that result, information is obtained about the biological role of the factor in the body. Study of disease: Many transgenic animals are designed to increase our understanding of how genes contribute to the development of disease. These are specially made to serve as models for human diseases so that investigation of new treatments for diseases is made possible. Today transgenic models exist for many human diseases such as cancer, cystic fibrosis, rheumatoid arthritis and Alzheimer’s. Biological products: Medicines required to treat certain human diseases can contain biological products, but such products are often expensive to make. Transgenic animals that produce useful biological products can be created by the introduction of the portion of DNA (or genes) which codes for a particular product such as human protein. Similar attempts are being made for treatment of phenylketonuria (PKU) and cystic fibrosis. In 1997, the first transgenic cow, Rosie, produced human protein-enriched milk (2.4 grams per litre). The milk contained the human alpha-lactalbumin and was nutritionally a more balanced product for human babies than natural cow-milk. Vaccine safety: Transgenic mice are being developed for use in testing the safety of vaccines before they are used on humans. Transgenic mice are being used to test the safety of the polio vaccine. If successful and found to be reliable, they could replace the use of monkeys to test the safety of batches of the vaccine. Chemical safety testing: This is known as toxicity/safety testing. The procedure is the same as that used for testing toxicity of drugs. Transgenic animals are made that carry genes which make them more sensitive to toxic substances than non-transgenic animals. They are then exposed to the toxic substances and the effects studied. Toxicity testing in such animals will allow us to obtain results in less time. The manipulation of living organisms by the human race cannot go on any further, without regulation. Some ethical standards are required to evaluate the morality of all human activities that might help or harm living organisms. Going beyond the morality of such issues, the biological significance of such things is also important. Genetic modification of organisms can have unpredicatable results when such organisms are introduced into the ecosystem. Therefore, the Indian Government has set up organisations such as GEAC (Genetic Engineering Approval Committee), which will make decisions regarding the validity of GM research and the safety of introducing GM-organisms for public services. The modification/usage of living organisms for public services (as food and medicine sources, for example) has also created problems with patents granted for the same. There is growing public anger that certain companies are being granted patents for products and technologies that make use of the genetic materials, plants and other biological resources that have long been identified, developed and used by farmers and indigenous people of a specific region/country. Rice is an important food grain, the presence of which goes back thousands of years in Asia’s agricultural history. There are an estimated 200,000 varieties of rice in India alone. The diversity of rice in India is one of the richest in the world. In 1997, an American company got patent rights on Basmati rice through the US Patent and Trademark Office. This allowed the company to sell a ‘new’ variety of Basmati, in the US and abroad. This ‘new’ variety of Basmati had actually been derived from Indian farmer’s varieties. Indian Basmati was crossed with semi-dwarf varieties and claimed as an invention or a novelty. The patent extends to functional equivalents, implying that other people selling Basmati rice could be restricted by the patent. Several attempts have also been made to patent uses, products and processes based on Indian traditional herbal medicines, e.g., turmeric neem. If we are not vigilant and we do not immediately counter these patent applications, other countries/individuals may encash on our rich legacy and we may not be able to do anything about it. Biopiracy is the term used to refer to the use of bio-resources by multinational companies and other organisations without proper authorisation from the countries and people concerned without compensatory payment. Most of the industrialised nations are rich financially but poor in biodiversity and traditional knowledge. In contrast the developing and the underdeveloped world is rich in biodiversity and traditional knowledge related to bio-resources. Traditional knowledge related to bio-resources can be exploited to develop modern applications and can also be used to save time, effort and expenditure during their commercialisation. There has been growing realisation of the injustice, inadequate compensation and benefit sharing between developed and developing countries. Therefore, some nations are developing laws to prevent such unauthorised exploitation of their bio-resources and traditional knowledge. The Indian Parliament has recently cleared the second amendment of the Indian Patents Bill, that takes such issues into consideration, including patent terms emergency provisions and research and development initiative. Biotechnology has given to humans several useful products by using microbes, plant, animals and their metabolic machinery. Recombinant DNA technology has made it possible to engineer microbes, plants and animals such that they have novel capabilities. Genetically Modified Organisms have been created by using methods other than natural methods to transfer one or more genes from one organism to another, generally using techniques such as recombinant DNA technology. GM plants have been useful in increasing crop yields, reduce post-harvest losses and make crops more tolerant of stresses. There are several GM crop plants with improved nutritional value of foods and reduced the reliance on chemical pesticides (pest-resistant crops). Recombinant DNA technological processes have made immense impact in the area of healthcare by enabling mass production of safe and more effective therapeutics. Since the recombinant therapeutics are identical to human proteins, they do not induce unwanted immunological responses and are free from risk of infection as was observed in case of similar products isolated from non-human sources. Human insulin is made in bacteria yet its structure is absolutely identical to that of the natural molecule. Transgenic animals are also used to understand how genes contribute to the development of a disease by serving as models for human diseases, such as cancer, cystic fibrosis, rheumatoid arthritis and Alzheimer’s. Gene therapy is the insertion of genes into an individual’s cells and tissues to treat diseases especially hereditary diseases. It does so by replacing a defective mutant allele with a functional one or gene targeting which involves gene amplification. Viruses that attack their hosts and introduce their genetic material into the host cell as part of their replication cycle are used as vectors to transfer healthy genes or more recently portions of genes.